The AquaticLife White T5/LED Hybrid Light w/ Mounting Systems is the best choice for use with AI White HD and Prime LED Lights, but can also be used for the Black AI, Kessil or EcoTech Lights. The Light includes two 2X24W T5/HO lights. Neither the LEDs or the T5 lamps are included. Two 2X24 watt T5/HO Lights connected together (bulbs not included). This light runs four 24W T5 bulbs in total. 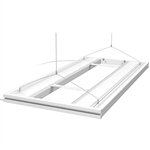 The included brackets will accommodate ONE of the following lights: the Aqua Illumination Hydra 26, Aqua Illumination Hydra 52, EcoTech Radion XR15w, EcoTech Radion XR30w or Kessil AP700. Length 24" X Width 18"
Includes White Decor End Caps to hide the cords. These are not included with the Black Hybrids. Includes hanging hardware. Does NOT include mounting hardware. 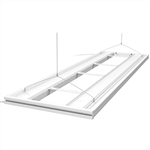 You can use two of the AquaticLife WHITE Universal Light Fixture Hangers For T5/HO LED Hybrid (Single). The AquaticLife White T5/LED Hybrid Light w/ Mounting Systems is the best choice for use with AI White HD and Prime LED Lights, but can also be used for the Black AI, Kessil or EcoTech Lights. The Light includes two 2X39W T5/HO lights. Neither the LEDs or the T5 lamps are included. The included brackets will accommodate TWO of the following lights: the Aqua Illumination Hydra 26, Aqua Illumination Hydra 52, EcoTech Radion XR15w or EcoTech Radio XR30w. It will only accommodate one of the Kessil AP700 LED fixtures. Length 36" X Width 18"
The AquaticLife White T5/LED Hybrid Light w/ Mounting Systems is the best choice for use with AI White HD and Prime LED Lights, but can also be used for the Black AI, Kessil or EcoTech Lights. The Light includes two 2X54W T5/HO lights. Neither the LEDs or the T5 lamps are included. The included brackets will accommodate THREE of the following lights: the Aqua Illumination Hydra 26, Aqua Illumination Hydra 52, EcoTech Radion XR15w or EcoTech Radio XR30w. It will accommodate TWO of the Kessil AP700 LED fixtures. Length 48" X Width 18"
Two 2X80 watt T5/HO Lights connected together (bulbs not included). This light runs four 80W T5 bulbs in total. The included brackets will accommodate FOUR of the following lights: the Aqua Illumination Hydra 26, Aqua Illumination Hydra 52, EcoTech Radion XR15w, EcoTech Radion XR30w or Kessil AP700. 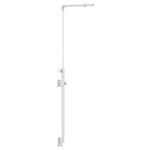 Length 61" X Width 18"
Includes hanging hardware. Does NOT include mounting hardware. You can use two of the AquaticLife Universal Light Fixture Hanger For T5/HO LED Hybrid (Single). NOTE: There is only ONE Hanger with each order. You will need two Hangers for the AquaticLife T5/HO Hybrid Lights. The AquaticLife Universal Light Fixture Hanger For T5/HO LED Hybrid (Single) is a premium mounting option that allows you to suspend aquarium light fixtures over your tank and easily attaches to your aquarium stand. It does not come with the suspension hardware. You can use the hardware that comes with the Hybrid. Adjustable stop collar keeps cables safely secured. Included Zip-ties make power cord management easy. Each hanger is rated for a maximum of 10 lbs. Adjustable to 44" high. Extension arm max length 13"